During the National Sanskrit Festival held at Bangalore, many eminent scholars and participants expressed the need to establish a ‘Virtual Academy’ having a global access that would promote building improved awareness about our ancient knowledge systems. Such an Academy would also undertake research and provide opportunity for studies on Ancient Indian Knowledge systems and would work towards bridging the ancient and modern knowledge systems, to provide best of both the worlds. Further, they also felt that Samskriti Foundation should take the lead in creating such an academy, as it has been involved in similar activities for over a decade now. 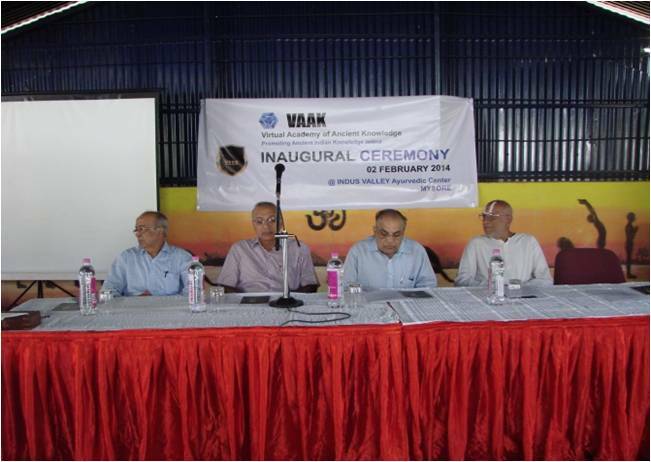 The Inaugural ceremony of the Virtual Academy of Ancient Knowledge Systems (VAAK) was held in the morning of 2nd February, 2014 at the auditorium of Indus Valley Ayurvedic Centre (IVAC), Mysore. 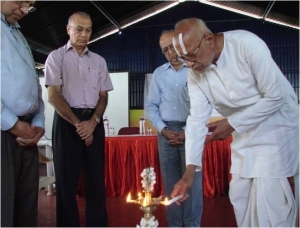 Dr. M. A. R. Iyengar, former senior scientist of the Bhabha Atomic Energy Commission, who is also well versed in traditional knowledge, formally inaugurated and launched the organization by lighting the lamp. Addressing the gathering after the inauguration, he exhorted the knowledge community to unearth the knowledge available in traditional texts and make them application oriented. 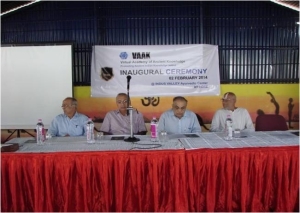 Sri M. A. N. Prasad, Administrative Secretary of VAAK, addressed the gathering and explained about the activities VAAK was planning to embark upon and its current relevance. Dr. M. A. Alwar made a presentation on the work done by Samskriti Foundation which covers software for teaching ancient scripts & Vedic texts, designing software for cataloguing and other functions in the field of preserving and interpreting ancient manuscripts on Science and Technology. He mentioned that with such a background, Samskriti Foundation was ideally suited for launching the VAAK. Prof. M. A. Lakshmithathachar, President of Samskriti Foundation and founder of VAAK spoke about the abundant amount of traditional knowledge in our ancient texts that awaited new interpretation and application in the current scientific scenario and explained how traditional knowledge could help in solving pressing problems in various spheres of human life, with vibrant examples. 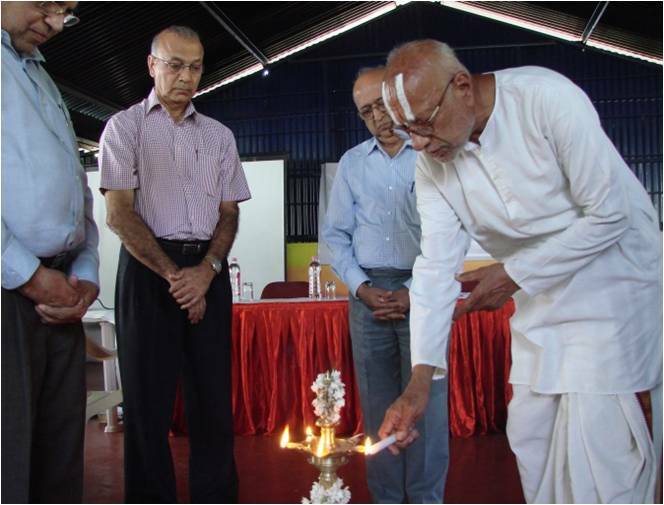 Dr. T. Krishna – an eminent modern physician, an expert in Ayurveda, and the chief of the IVAC, where the event was held – presided over the inaugural function. In his presidential address he appreciated the efforts that have gone into the visualizing of this ‘Virtual Academy’, which he felt was the need of the hour, as it transcended all boundaries. A few learned members of the audience also spoke and pledged their wholehearted support for such an endeavor. The function concluded with a Vedic Benediction followed by lunch for all the participants.